Lt Clement MINER (1638 – 1700) is Alex’s 9th great grandfather – one of 1,024 grandfathers in this generation of the Miner line. Clement Miner was baptized on 4 Mar 1638 in Hingham, MA. His parents were: Thomas MINER and Grace PALMER. He moved to New London, CT in 1645 with his father and remained there after his father moved on to Stonington, CT. He married Frances BURCHAM on 26 Nov 1662. Frances died on 6 Dec 1672, shortly after the birth of Ann, and he married second Martha Wellman, on 20 Feb 1672/73. He married third Joanna [__?__]. 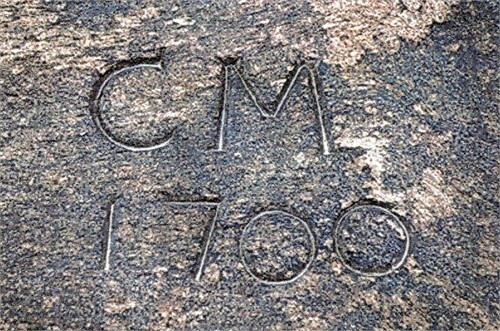 Clement died on 8 Oct 1700 in New London, CT. and is buried in the Ancient Burying Ground where there is a stone slab marked “C M 1700”. Frances Burcham was born c. 1644 in Lynn MA. She was daughter of Edward BURCHAM of Lynn, Mass and Katherine MASON. She first married 8 Jun 1660 in Boston, Suffolk, Mass to Isaac Willey Jr. (b. 2 Aug 1640 in Boston, Mass – d. Aug 1662 in New London, CT). (Isaac’s brother John WILLEY is also our ancestor) Frances died on 6 Dec 1672 shortly after the birth of Ann. Martha Wellman was born in 1652. Her parents were William Wellman and Elizabeth Spencer. Martha died on 5 Jul 1681. 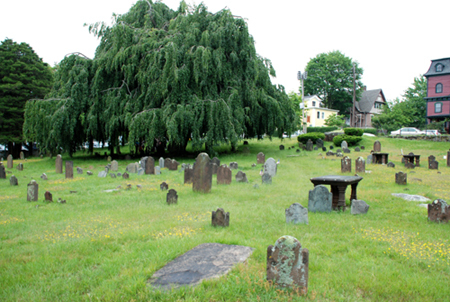 Joanna [__?__] was born 1638 in Stonington, New London, CT. Joanna died on 10 Oct 1700. 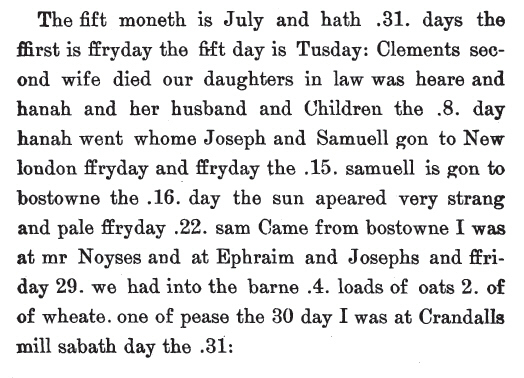 Children by Frances Burcham recorded in New London, CT and baptized on 30 April 1670 at First Church Congregational. Anne baptized 22 December 1672. Lieutenant Clement Miner went to Nameaug (New London), CT in 1658 with his father’s family. When his father moved from New London to Quiambog and Togwonk in Stonington, Clement remained behind and became a permanent resident of New London. He received a grant of land near to that of Walter Palmer’s whose land it abutted on the south. In Sept 1669, Clement applied for a house lot next to that of Grace Chappell. He was a very active man and held many public offices in the town. ” Wm. Hough, John Stebbins, Clement Miner, and Isaac WILLEY to lay out the King’s highway between New London and the head of Niantick river. In October 1692, and in May 1696, Clement served as a Deputy for New London in the Connecticut General Court. On April 30, 1691 he joined the First Congregational Church at New London. It is thought that his election to the office of Deacon was soon after the death of Deacon Hough, 10 Aug 1683. Shortly after this date, the Pastor, Rev. Bradstreet, died, and this probably explains why no record of Clements election of the Deaconate was made. At a town meeting on 19 Dec 1683, Clement and several others formed a committee to seek advice in securing a minister for the town to replace Rev. Bradstreet. Ensign Clement was one of those appointed to assign seats in the meetinghouse. At a Towne meeting November ye 19, 1683. Clement saw service in King Philip’ War when he would have been about 37 years old. As a volunteer, he was granted a lot in Voluntown, Connecticut. Joseph’s first wife Elizabeth Comstock was born 9 Jun 1665 in Lyme, New London, CT. Her parents were John Comstock and Abigail Chappel. Elizabeth died 3 May 1692 in New London, New London, CT.
Joseph’s second wife Susanna Keeney was born 6 Sep 1662. She first married in 1685 to Ezekiel Turner (1651 – 1704) son of John Turner and Mary Brewster. Susanna died 13 Dec 1748. Clement’s wife Martha Mould was born 25 Dec 1674 in New London, New London, CT. Her parents were Hugh Mould and Martha Coit. Martha died 2 Aug 1743 in New London, New London, CT.
Clement and Martha were the parents of eleven children, all born in New London. Clement was commissioned Ensign of the 1st New London Company in May 1708, and he was chosen as Lieutenant on May 25, 1715. Thus, he is often referred to as Lt. Clement Miner. According to Joshua Hempstead’s diary, “Lt Clement Miner aged 71 & more died of a plursie” April 8, 1740, in New London. He was probably buried in the town’s ancient burial grounds where his father was buried in 1700, but no record of his burial has been found. 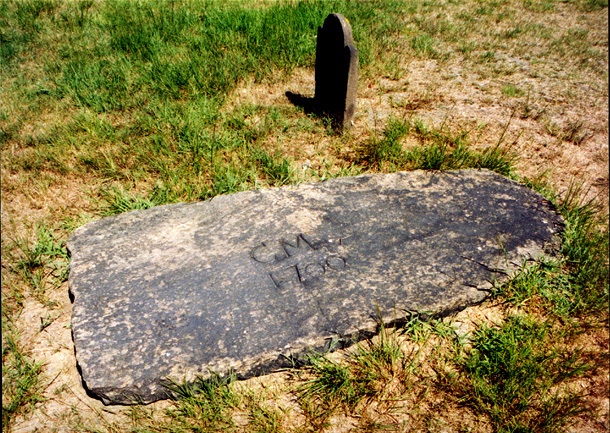 Clement’s oldest son, Clement III died 9 Aug 1775, Norwich New London, CT.
Clement Miner III Headstone — Headstone inscription not legible in June of 2009. Grave located using Charles Hale’s Collection of cemetery inscriptions for Bill Hill Cemetery (310-3) completed in 1934. Clement’s stone is located between that of John M Miner and Rev. Daniel Miner. 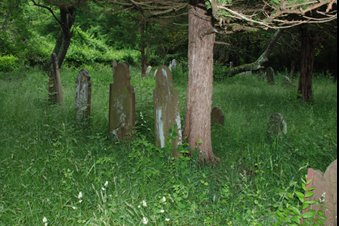 In 1934 the inscription in memory of Clement Miner read: “Clemant Miner, died Aug. 9, 1775, age 73.” Today the Bill Hill Cemetery in Lyme, CT is largely overgrown and in disrepair. 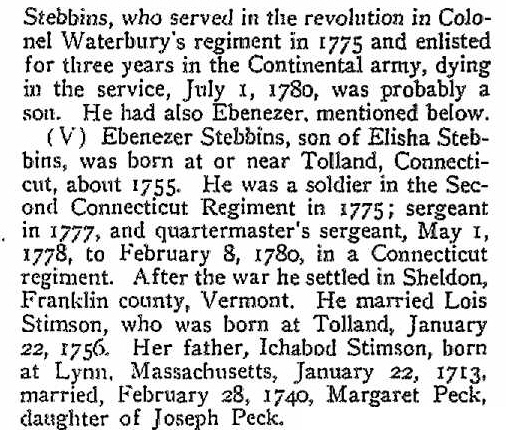 Phebe’s husband John Stebbins was born 11 Feb 1666 in New London, New London, CT. Her parents were John Stebbins (1640-1707) and Deborah Moore (1643-1696). His maternal grandparents were Miles MOORE and Isabell JOYNER. 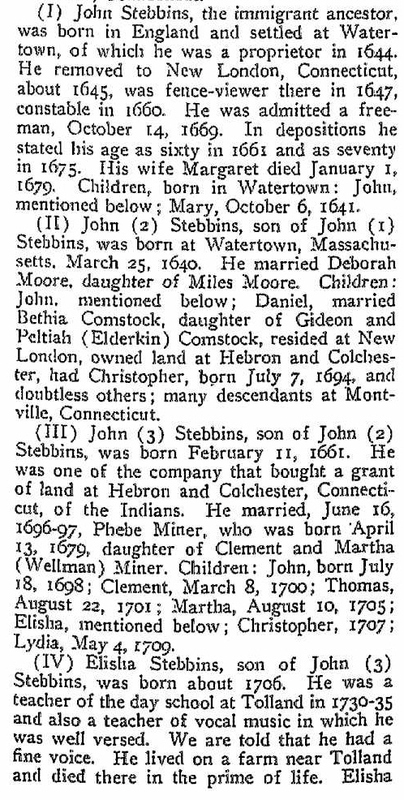 John died 16 Sep 1756 in New London, New London, CT.
Our branch of the Miner and Stebbins families became very close with several intermarriages in the next generations. John’s grandparents John Stebbins (1602-1685) and Margaret Riggs (1615-1679) are believed to have been born and raised and married in about 1633 in England. They immigrated to America in the 1630s when John Stebbins (1602-1685) came to be a proprietor at Watertown, Massachusetts where their 3 children were probably born. John Stebbins (1602-1685) was among the first settlers in 1645 in Pequot Country (what became New London, Connecticut) when he moved to Upper Mamacock. It officially became New London, Connecticut on 06 May 1646. John Stebbins (1602-1685) had homelot #5 of 36 in 1647 at New London and his family soon joined him there. John Stebbins (1602-1685) was a New London fence-viewer in 1647 and a New London constable in 1660. John Stebbins (1602-1685) was a Freeman on 14 Oct 1669. This entry was posted in 11th Generation, Historical Monument, Line - Miner, Public Office, Veteran and tagged Hingham, New London, Voluntown. Bookmark the permalink.